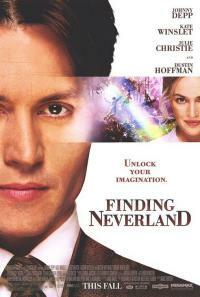 It was a wintry day so we watched a DVD of Finding Neverland, with Johnny Depp and Kate Winslet (reviews here and here) about J.M. Barrie and his friendship with the Llewelyn Davies family, especially its its young sons who inspired him to create the classic play and children’s story Peter Pan. We liked the movie a lot. James Barrie was a curious and complex character. Anthony Lane has a very fine article on JM Barrie in the New Yorker of 15 November 2004. After the deaths of their parents from cancers, he became guardian of the Llewelyn Davies boys, the last of whom, Nico, died in 1980. Two of the five boys died before Barrie: George in Flanders during the First World War, and Michael who drowned in 1921 at Oxford, in the arms of a friend who may have been his lover. (The relationship between Peter and his friend Rupert Buxton is explored in Barry Lowe’s play The death of Peter Pan.) The deaths of Arthur and Sylvia and two of their sons in such ways deeply saddened Barrie for the rest of his life, and also took its toll on esteemed publisher Peter Llewelyn Davies, after whom Peter Pan was named. He killed himself in 1960. In his article, Lane speculates whether it was coincidence that this was shortly before the centenary of Barrie’s birth, which would have brought renewed attention to Peter Pan. Barrie was to become wealthy and famous and was made Sir James Barrie, Baronet, and a member of the Order of Merit. The Order of Merit is more interesting than most of the other British honours, as its members are chosen by the monarch personally, not recommended by the government. It has a maximum of only 24 full members, who are honoured for achievement in the arts, sciences and other fields of learning and endeavour. The OM is one of the highest royal honours, above all knighthoods except than the Order of the Garter and the Order of the Thistle (which are also bestowed by the monarch personally). This being her official birthday, the Queen has made three new appointments to the Order: naturalist and broadcaster Sir David Attenborough, former politician and first woman Speaker of the House of Commons, Baroness Boothroyd, and military historian Professor Sir Michael Howard. There have been just 168 members of the Order since it was founded by King Edward VII in 1902, about half of whom have been appointed by the present Queen during her long reign. The current membership is an interesting indication of the Queen’s views on merit and distinction: (in order of appointment) The Duke of Edinburgh, Professor William Chadwick, Sir Andrew Huxley, Dr Frederick Sanger, Dame Cicely Saunders, Baroness Thatcher, Dame Joan Sutherland, Sir Michael Atiyah, Lucian Freud, Sir Aaron Klug, Nelson Mandela (Honorary member), Lord Foster of Thames Bank, Sir Denis Rooke, Sir James Black, Sir Anthony Caro, Professor Sir Roger Penrose, Sir Thomas Stoppard, The Prince of Wales, Lord May of Oxford, Lord Rothschild, Sir David Attenborough, Baroness Boothroyd, and Sir Michael Howard.